Crankbaits for walleye are one the most the widely used artificial lures in any walleye anglers arsenal. Versatility in fishing presentations is the main reason for it’s popularity. Crankbaits can be trolled / cranked providing a side-to-side wobble flash that triggers walleyes, or “jerked” a stop & go retrieve displaying a erratic action appealing to sluggish biters. For dark, stained or muddy waters the hot colors work effective, here’s a few top producers. The largest group of walleye crankbaits are slender type stick bait to replicate minnows, other types of bodies include shad, smelt, perch, and cisco shaped baits displaying a wider body profile in order to “match the hatch” of forage depending on the body of water you’re fishing. Size is another key factor start out small in Spring 2″-2 1/2″ as most forage species spawn in the Spring, walleyes as other predators will take advantage of this feeding opportunity. During the Summer as the forage growth increases the best size is 3″-4.” When Fall arrives and the remaining forage is fully grown use 5″-6″ as walleyes are fatting up for winter. The action of a walleye crankbait by many avid walleye anglers is the most important for making the grade attracting walleyes to bite. The action sought is a top-to-bottom roll maximizing the side flash that trigger walleyes to bite. Walleye crankbait action is classified by “three sub-categories”, subtle action, moderate action and high action. Walleyes are cold blooded animal. Its metabolism is directly dependent upon water temperature. The lower the temperature, the lower its metabolism and the less food its body demands and how they feed. Feeding activity gradually increases as the water warms. As a general rule of thumb, feeding activity is greatest between 55 and 75 degrees. The time of year and the water temperature will be the basis of which type of action category is used. Early Spring and Late Fall when water temperature is 50 degress and under, subtle action baits are most successful these are classfied as straight minnow type crank baits. As the water temperature increases during late spring into early summer to 50 to 60 degrees it’s time for moderate action. The moderate action lures will have a slightly deep diving lip, sporting a curved body profile to enhance the action. When the water temperature reaches 70 degrees and above during the mid summer peak, it’s time to think aggressive as the walleye feeding and its metabolism rate is peaking, high action crankbaits are the best choice. There are two categories of subsurface plugs, both have floating or sinking models. The first are diving lures that dive with attached plastic/metal lips or dive based on the lure body design such as cupped, pointed head or a flattened curved forehead, all have a side to side action as they travel through the water, these are commonly known as crankbaits. The second group of plugs refer to the action of the lure provided by the angler in the retrieve. 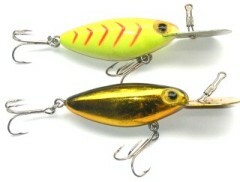 These are classified as gliders, jerkbaits and twitch baits, the action of the each lure is achieved through a series of cadence pulls, strong jerks, or short stop and go techniques. Diving lures will catch fish in any type of water calm or rough any time of the day. In selecting lures with a lip attached to the nose of the lure the angle of lip will determine the running depth of the lure, for instance a deep running lure will have a elongated lip attached approximately 90 degrees horizontal from the nose which acts as a diving plane forcing the lure downward. Mid range divers will have a lip set at a 45 degree angle. Shallow running lures will have lip placed vertically off of the nose creating a water resistance forcing the lure to run shallow. Diving lures will run at depths from just under the surface at 1 foot to 20 feet or greater. All lure companies provide the running/diving depth of each lure on their box or packaging. It is wise to have a few of each to cover the fishing situations you could encounter. The deep runners are classified as 10 feet plus, mid range 5-10 feet and shallow are 1-3 feet. This is the most popular type and the most versatile crankbait lure designed to imitate a thin bodied baitfish. For shallow lures running at 1-3 feet as a floater this will maintain the shallow depth. Anglers who use midrange running lures have a few more options. In casting the angler can pop the lure along the surface or crank it a few feet down to 5 to 8 feet with a straight retrieve. For trolling using a midrange lip off of downrigger or lead core line the lure will maintain the set depth. When casting deep running lures this allows the angler to bounce lures off of deep structure (bottom bouncing) such as rocks or wood with out getting snagged by letting the lure just float up after making contact. 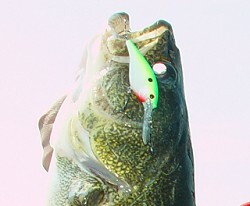 Similar to the floating minnow style with a diving lip. These lures imitate the forage of shad and perch with a wider or fatter body style. Made from balsa wood and hollow plastic with and with out internal chambers filled with shot to produce a loud rattle. The series of lures shown above have been made for many years, timed tested and still today catch many fish. The lure body design to dive is based on a cupped, or a flattened curved forehead all have a side to side wobble action as they travel through the water. These thin bodied lures do not have a diving lip and are attached to the line with the eye on top of the head, resulting in a tight wiggle. All vibrating lures have internal chambers filled with shot to produce a loud rattle. Most are sinking models but some do float at rest. Also known as a countdown this lure is weighted to sink horizontally. When fish suspend over 10 feet at a specific depth the sinking lure is a very good option to use. The angler simply cast the lure and count’s down at a rate of 1 foot per second to the specified depth and retrieves the lure. The sinking lure uses a midrange lip to maintain the depth until the end of the retrieve. Also referred as a suspending lure or a jerk bait. The lure is designed using an internal weight system or a weighted tape to achieve neutral buoyancy. The presentation is an erratic jerk pause type of retrieve, when stopped the lure will remain suspended and motionless in the water. Very good lure for finicky fish that follows and don’t bite. Gliders and Twitch baits are lipless and sink, the action of each lure is in part provided by the angler. The Twitch bait (Top) is retrieved with a series of short taps of the rod or twitches which gives the lure a erratic motion, up down side to side action. The Glider (Bottom) is retrieved using timed cadence short pulls causing the lure to glide side to side or a underwater walk the dog action creating a dart and flash of the lure. Freshwater game fish are predatory by nature there also opportunistic and will take advantage of any food source presented to them to fill their feeding needs. Other than baitfish they will also feed on crawfish, frogs, water snakes, swimming rodents, amphibians and insects. The above photo shows lures that imitate each type.